Need a simple spring dessert? 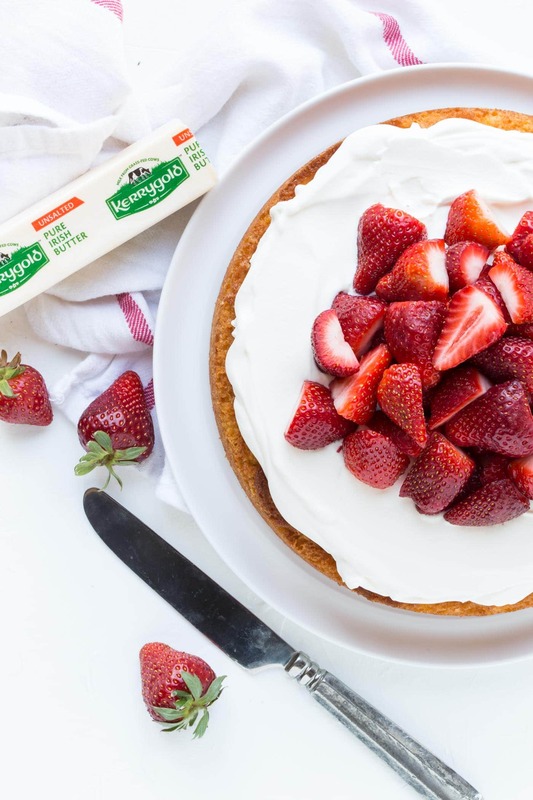 This not-too-sweet Strawberry Almond Cake recipe will steal the show at all of your spring parties. As food bloggers, Lisa and I have friends who are killer bakers. These are seriously talented people who can create and decorate the heck out of cakes and pastries. Trust me when I say no one will ever confuse me with being a ‘real’ baker. But just because my talents with a piping bag are almost nonexistent doesn’t mean I don’t like to bake. Rather, I bake MY way, which means simply and seasonally. This Strawberry Almond Cake is the perfect example. Pretty enough for a party but approachable enough for those amateur bakers out there (like me). You can never have enough recipes for strawberries once spring berry season rolls around (we have no less than 13 strawberry recipes on the site right now! ), so make sure to add this Strawberry Almond Cake to your recipe box. The almond cake portion of this recipe is made in one 9-inch round cake pan and maintains a light texture thanks to a combination of all-purpose flour and almond flour. Kerrygold Pure Irish Butter, which has a higher butterfat content than most supermarket butters, lends richness to the batter. A reasonable amount of sugar keeps the sweetness in check, too. The result is a sturdy yet tender cake that begs to be piled high with cream and berries. I’m not a huge fan of super sugary frosting, so instead I opted for a quick and easy mascarpone whipped cream that tastes rich without being overly sweet. The addition of mascarpone allows you to make the whipped cream a few hours in advance, too, and it will still hold its shape. Simply keep the mascarpone whipped cream covered in the fridge for up to 4 hours until ready to spread on the cake. The finishing touch for your Strawberry Almond Cake masterpiece is to pile it high with fresh and juicy sliced strawberries. Tip: Cream whips better when it’s cold, so pop your bowl and beaters in the fridge 20 minutes before making the mascarpone whipped cream. 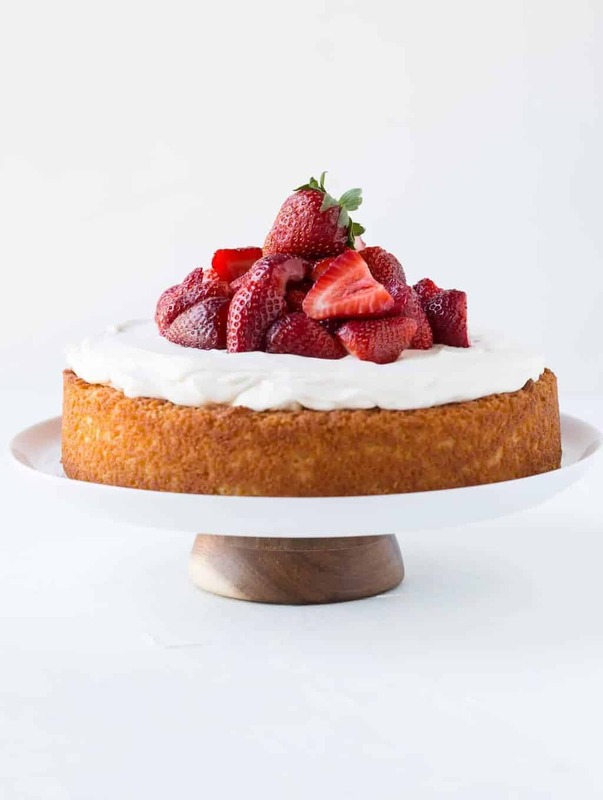 Though rather simple and straightforward, this stunning Strawberry Almond Cake will be the standout star of all of your spring showers or graduations. Or even bake one up as a special dessert for Mother’s Day. Just be forewarned: if you show up with this Strawberry Almond Cake, people may think you are a ‘real’ baker after all. Preheat the oven to 350 degrees F. Spray a 9-inch round cake pan with baking spray. Set aside. Combine all-purpose flour, almond flour and baking powder in a small bowl. Whisk to incorporate. Set aside. In a large bowl, beat the butter and sugar until light and fluffy. Mix in the eggs one at a time. Mix in the yogurt and extracts. Fold in flour mixture until just incorporated. Pour the batter into prepared pan. Bake for 35-40 minutes, until the cake feels springy to the touch in the center and a toothpick inserted into the center comes out clean. Cool cake on a wire rack for 10 minutes; then turn it out of the pan onto the rack. Cool completely. Add cream, mascarpone, sugar and vanilla to a bowl; beat with a hand mixer on high until thoroughly incorporated and cream thickens and holds its shape (about 3-4 minutes). Use an offset spreader to spread cream on top of cake. Pile strawberries on the top of the cake. My piping bag skills are also in need of improvement. But I don’t bother. I also like to bake something simpler. This cake looks delicious. Those strawberries on top look so fresh and yum.